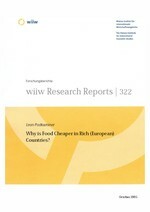 Relative to non-food items, food tends to be cheaper in rich, as compared with poor European countries. This tendency cannot be explained in terms of cost developments or foreign-trade considerations. A positive explanation proposed focuses on demand-income-supply interaction. An analysis of a cross-country price-augmented modification of Engel's Law, econometrically specified, indicates that the relative price of food is related positively to the supply of food items and negatively to that of non-food items. This finding is consistent with ¿agricultural price scissors' and also casts a different light on the nature of economic development and structural change.